The theme this month is "edges" and I thought I would show some of the edges of Boston City Hall, a victim poster child of the Brutalist yes, that is a real style of architecture. To view how others have interpreted the theme this month click here to view thumbnails for all participants. You have indeed picked a building with a lot of edges. I don't know about the rest of the building but this photo makes it look rather cold and foreboding, not welcoming of the people the way I would think that a City Hall should be. This looks more like a giant military pill box or bunker. I love this image! What a great composition and use of the lines in the subject. The black and white an excellent choice, it gives the image a timeless feeling. Spectacular building and so many edges, but my goodness, what a stunning photo with that light, the figures and shadow. Love it! Oh what a fantastic photo. 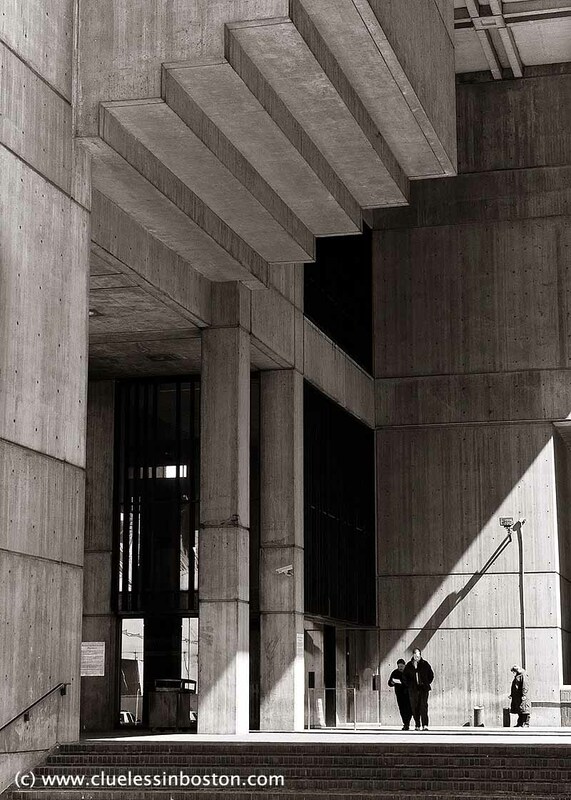 "Brutalist" is a perfect name! here, we would call that "stalinian style". the result is the same! BUT: the good side is that it allows to make wonderful pictures!Yours is so strong and impressive! I just learned about Brutalism in architecture thanks to you. Wow, that's a blow! Your photo captures it beautifully and certainly fits today's theme!!! Actually, I rather like the stark lines and edges. The EDGES of those overhead steps make an optical illusion! Cool monochrome snap for theme day! Perfect, perfect, perfect. I also really like the larger photos. Very "edgy" and perfect for Theme Day! Great choice of edges for the theme day. And great b&w. Great image .... and a nice monochrome. Love the lines and light! Well done! awesome image for theme day. quite epic! I think this is one of the best edge photos. Well done!